...the best bouquet you can send! Retro punched flowers can produce some lovely effects with just the addition of some leaves. 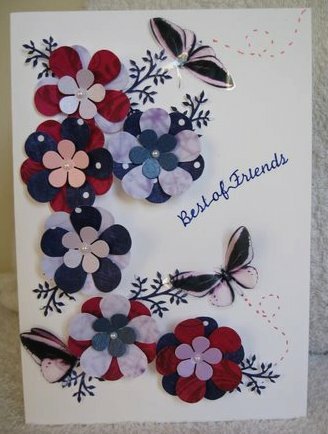 This pretty card was made using just three punches, and you layer them up in the colourways you have chosen. I have added some acetate butterflies and doodled the trails in coloured pen. The sentiment is a peel off and the whole thing is completed in no time at all. Quick and easy for the last minute request for a card. 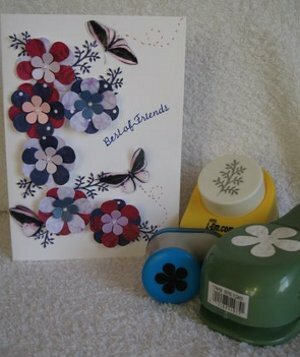 The three I used are the "Retro flower" punch from Paper Shapers (the green punch) and I have punched it twice. The blue one is from Xcut and is a smaller version of the other, you will need one of these for the center. And the leaves are from the "Ash Branch" from L-Emm. and you can use as many leaves as you like around your flowers. All are very easy to use, and of course once you have them they can be used in any number of different ways to produce some lovely effects on your cards. 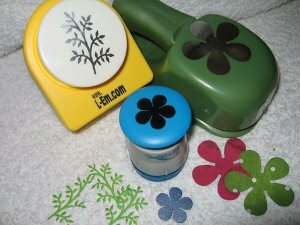 But you can use any flower and leaf punches that you have in your stash. The center of the flower is finished with a flatback pearl, but you could add a button, gemstone or some glitter. The choice is yours. These pretty Retro punched flowers can be used for any occasion. Make your colours blend or contrast, and if you are uncomfortable putting colours together then take a look at the colour wheel for guidance in making your choices. But don't be afraid of colour, just look around at nature and see some of the unusual combinations there. And if you aren't happy with the ones you have punched then save them for another project... and punch some more! Easy peasy! Just have fun with the paper and remember crafters don't make mistakes... we just have happy accidents!